I have grown a monster. This is the harvest from just one plant, grown from a tiny seed tuber back in April 2017. Each one of those long oval roots is the size of a marrow. For all that it looks like a sweet potato it is in fact a yacon (Smallanthus sonchifolius), a tuberous perennial hailing originally from South America, historically grown on the eastern slopes of the Andes. It's also known as Peruvian ground apple and, in its native South America is also confusingly known as jicama. It's definitely not a jicama, though - jicama is a Mexican legume also grown for its underground rhizomes, although the taste is not dissimilar. It is however related to the Jerusalem artichoke and therefore also kin to the sunflower. The relationship becomes apparent when the plant begins to grow in early summer with its sturdy, slightly hairy, stem and broad leaves. At the end of summer the yacon plant produces small bright yellow flowers very similar to those of the Jerusalem artichoke. I first read about yacon in Mark Diacono's book A Taste of the Unexpected. 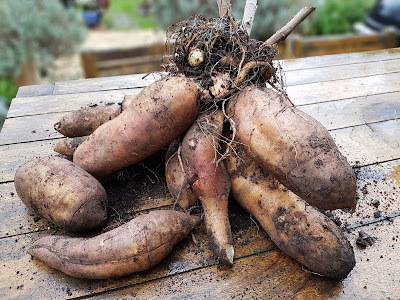 At the time I was experimenting with growing oca, another South American tuber, and finding the results somewhat underwhelming. The idea of devoting yet more space to another 'lost crop of the Incas' did not really appeal. Little did I realise that I'd just pulled up the (very much) smaller of the two. The second plant I left to grow on, mindful of Mark Diacono's advice that the roots will stay happily in the ground until - and beyond - the first frosts. There's no way I can use all this yacon at once. After adding them to salads where the mildly sweet, juicy crunch gives a winter salad some welcome texture, I also tried yacon remoulade, stirring julienned yacon into creme fraiche laced with mustard and a bit of lemon juice. They were julienned again with carrot for a dish based on a south-east Asian papaya salad: sprinkled with a dressing made with fish sauce, lime juice, crushed garlic and sugar, and topped with cashew nuts. That went down very well. The roots store like potatoes: keep cool - say, around 5-10 degrees Celsius - in the dark, not too dry (they will wither), but definitely not damp (they will rot). Some roots won't keep, but those that do should stay good for weeks if not months. 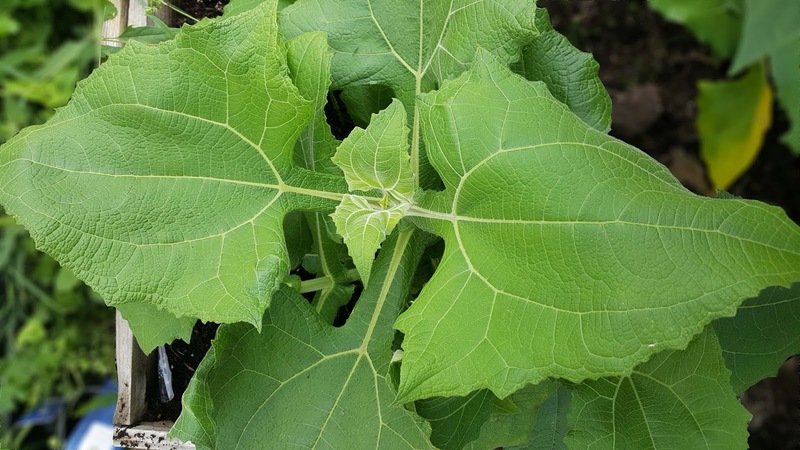 There's also no need to to buy yacon starter plants each year. Once the giant swollen tubers have been removed, you're left with the stems and the small round buds around the crown. These will grow again the following season. 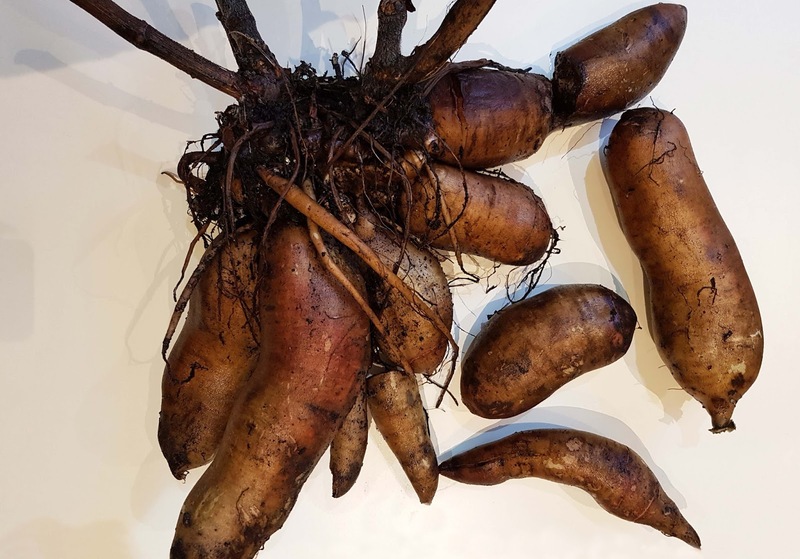 Bury this remaining haulm and nodules in barely damp soil or sand and keep somewhere cool and dark - possibly the same place that is storing the roots for eating. Plant out again in spring, somewhere sunny and well mulched with manure, once the soil has warmed up a bit and the frosts should be over. You should probably protect the new leaves from slugs and snails, but I found the emerging plants needed little in way of cossetting. Last year was a notably good growing season for many 'long season' crops so it will be interesting to see how they do this year in whatever conditions 2018 throws up.